PHOTO: River cruises that visit Christmas markets are very popular for families with children, including one in Nuremberg, Germany. If your clients want to take their kids on the industry’s hottest vacation product — a river cruise — do your research and make careful recommendations. While river cruising generally is not a kid-friendly product, there are some departures tailored to parents who want to bring along their children. Most notably, Tauck Bridges and Uniworld Boutique River Cruise Collection offer river cruise trips in Europe aimed specifically at families with kids. The beauty of this kind of family trip is that Tauck takes care of all the details, so adults can focus on bonding with their children rather than worrying about finding a kid-friendly restaurant, lugging baggage or driving a rental car in unfamiliar destinations. Virtually everything is included in the upfront price, so there are few reasons to open wallets. Plus, travelers unpack only once. For 2015, Tauck Bridges is offering three departures of the eight-day Blue Danube: Family Riverboat Adventure priced from $3,990 per person on the ms Swiss Jewel or ms Savor Departure dates are June 20, July 4 and Aug. 7, 2015. This cruise sails from Budapest, Hungary, to Slovakia, Austria and Germany, and includes riding a giant Ferris wheel in a Vienna amusement park, seeing “The Sound of Music” sites in Salzburg, and learning how to make marzipan in Passau, Germany. The eight-day “Castles on the Rhine: Family Riverboat Adventure” is scheduled for two departures in 2015 - June 15 and July 23 — and also is priced from $3,990. It sails between Basel and Amsterdam aboard the ms Inspire, visiting Switzerland, France, Germany and The Netherlands. This trip includes a ride aboard the world’s steepest cogwheel train in the Swiss Alps, an exclusive dinner at a 1,000-year-old castle, French language lessons, and more. The 10-day Bon Voyage! France Family River Cruise, priced from $4,990, includes two nights in Paris and a seven-night Rhône River cruise on the ms Swiss Emerald. Excursions include a scavenger hunt at the Louvre, a picnic lunch in the Tuileries Gardens and a tour of Provence. Tauck recommends these river cruises for children ages 8 and up and discourages them for toddlers under 3. “Though children 3 years of age and older are welcome on our journeys, our experience tells us that children 8 and older will get the most out of a Tauck Bridges trip,” the company says in its very detailed overview of family travel. “We ask that you use good judgment if considering bringing a young child or children on a Tauck journey,” the company says. “Regardless of destination, our journeys are not appropriate for infants or children under 3 years of age. Many of our itineraries do not cater to young children’s interests, patience or stamina, and therefore aren’t really suited to children of too young an age. Young children’s behavior can be unpredictable, and with consideration for all fellow travelers wanting to enjoy their vacation to its fullest, it is important to know and understand that Tauck has the right to ask any tour member who is disruptive to a group to leave the tour whether they are 6 or 66 years of age. 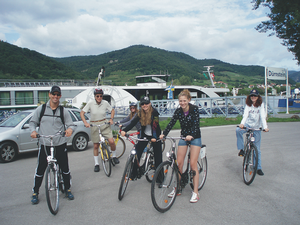 PHOTO: Tauck Bridges’ family river cruises offer cycling along the rivers. It would be helpful for a travel agent to read the entire section on family travel. It’s under a tab called “Family Travel: Tauck Bridges” in the FAQ section of the website. Visit www.tauck.com/faq.aspx. Children under 18 must be booked in a cabin with at least one adult. Tauck has some triple and quadruple accommodations that are adjacent, but not connecting. These staterooms feature a queen-size bed and a full-size pull-out couch. Uniworld schedules special multigenerational, family-friendly itineraries during school vacations. They feature special pricing with half-price fares for kids and teens between the ages of 4 and 18 when traveling with an adult. 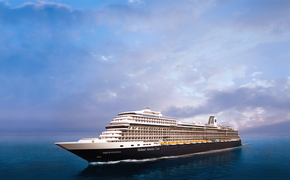 Fares include lectures and demonstrations onboard, hosted shore excursions, complimentary use of bicycles, all gratuities onboard and onshore and transfers. Young people can also take a ship tour with the captain or the hotel manager. When not touring Europe, kids of any age can also play in a room stocked with a PlayStation 2 and Wii. Uniworld’s family-friendly river cruises operate on several itineraries. 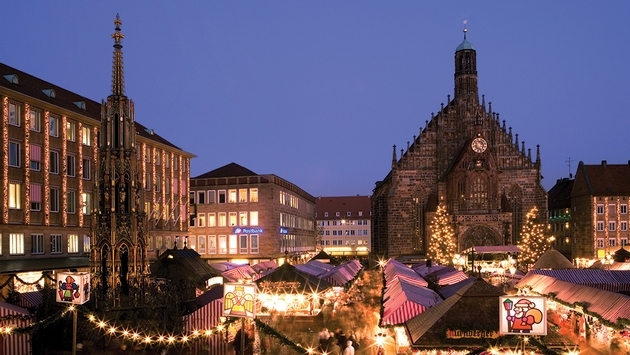 The eight-day Classic Christmas Markets between Frankfurt and Nuremberg will depart on Dec. 14, 2014, as well as Dec. 13, 2015, on the 130-passenger River Queen. Fares for this year’s departure start at $2,799. The eight-day Castles along the Rhine from Basel to Amsterdam will depart on July 8 and July 15, 2015, on the 132-guest River Empress, priced from $3,799 cruise-only. And the eight-day Paris & Normandy cruise roundtrip from Paris will set off on July 5 and Aug. 2, 2015, on the 118-passenger River Baroness, priced from $3,899. As for other river cruise companies, they also say that their trips are not appropriate for younger kids and toddlers. AmaWaterways’ policy also states that guests under the age of 18 must be booked in a cabin with an adult and must be supervised at all times. Children under 11 can share a cabin with two adults but must share the bed with the adults as no additional bed will be provided. The company also notes that most of its cabins and suites have French or full balconies that might not be safe for little ones left unsupervised. That said, the line welcomes families with older children on some river cruises, in particular the Christmas Markets cruises. The staff sets up a kids table in the dining room, and a jolly old man in a red suit makes a surprise appearance. Viking River Cruises also does not maintain facilities or services for children. Those under 18 must be accompanied and share a cabin with a parent, legal guardian or other responsible adult over the age of 21. A version of this article appears in print in the July 2014 issue of Agent@Home Magazine.